Down To The Sea, Monkey, House of Cards, Please Read the Letter, Misty Mountain Hop, Rich Woman, Twelve Gates To The City/Wade In The Water, Trouble Don’t Go, All The Kings Horses, Satisfied Mind, Move On Up In Glory, Satan Your Kingdom Must Come Down, Central Two O’ Nine, Houses Of The Holy, Tall Cool One, Over The Hills And Far Away, Gallows Pole, Encore: Harm’s Swift Way, Rock and Roll, I Bid You Goodnight. 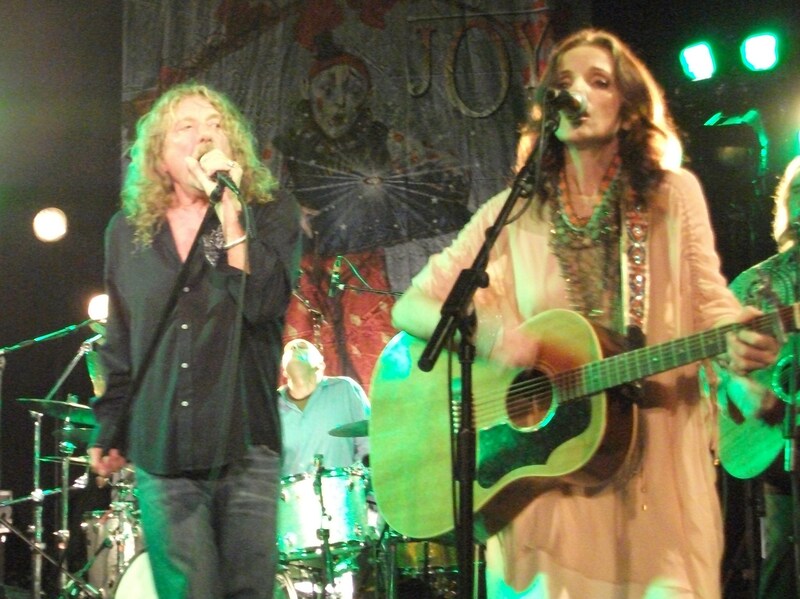 Robert Plant and The Band Of Joy made a triumphant debut at London’s HMV Forum last night. The London audience were hugely receptive from the moment he kicked in with a driving Down To The Sea. The balanced set list included plenty of crown pleasing moments. Highlights: An effective Clarksdale arrangement of Please Read The Letter, a majestic House of Cards, a delicate stroll through All The Kings Horses and a delightful Angel Dance. 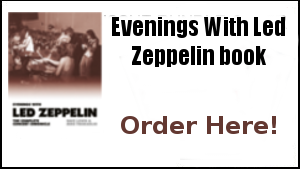 The Zep injections were rapturously received- Misty Mountain Hop and Houses of The Holy had the audience singing along and it was emotional to hear the opening lines from Over The Hills And Far Away sung live in the UK for the first time since Cafe De Paris. Throughout the set, the individual strengths of the band shone through. Buddy was awesome on Monkey, and Patty supplemented Plant’s vocals perfectly. Darrell Scott’s multi instrumental talents added invention to every performance and collectively their voices blended at the right times to add substance to the arrangements. The move away from straight rock may be beguiling to some but judging by the reaction here, those with open ears are finding much to admire in this new set up. On the home straight Tall Cool One and Gallows Pole hit the mark. Just before Rock And Roll a lady next to me exclaimed ‘’I love you Robert’ . A sentiment that seemed to sum up the wave of goodwill that echoed throughout the Forum. ‘’Oh to be in England…’’ commented Robert towards the end. Judging by the reaction to this London showcase, fans across the country will be well pleased that Robert and The Band Of Joy will be back in the homeland come October. Before the gig it was great to see so many familiar faces in the TBL meet in the Assembly Rooms pub. Many thanks for all those that dropped by to say hi. All in all these past few days have been a very welcome pre Birthday present for this particular writer. Suffice to say The Band Of Joy journey is underway.-catch it wherever you can. My boyfriend works as a venue manager and heard this evening that Robert Plant has changed his itinerary on Sunday 24th October to take in a Led Zeppelin tribute band gigging in Birkenhead. Venue is a club called Swinging Arm, but no other details. Agree with BillyR above! Robert is better than this. He is an innovator and doing retreads of hillbilly music just does not bring out what he is so capable of. I hope he finishes this stage of his musical wanderings up quickly, makes everyone happy who likes this stuff, gets the rocking chair on the porch out of his system and moves into a totally new direction! Some of the African Arabic influences, Shaken & Stirred etc… that was a path never fully explored yet seemed to be quite interesting to me anyways. ps i loved what rp has written with jp, but i think robert is unique in going on following his inspiration and never looking back, if not to create and recreate something new. intelligence is as important as talent in a big artist. it was magic to be there in the first row standing seeing his spectacular, stellar charisma & voice come out and shine. this band is truly joyful. i love buddy and patty so much. hope to see some tbl people in dublin and maybe in paris also? someone go to france too? Think I might get shot down in flames but here we go…..didn’t enjoy this gig I’m afraid. 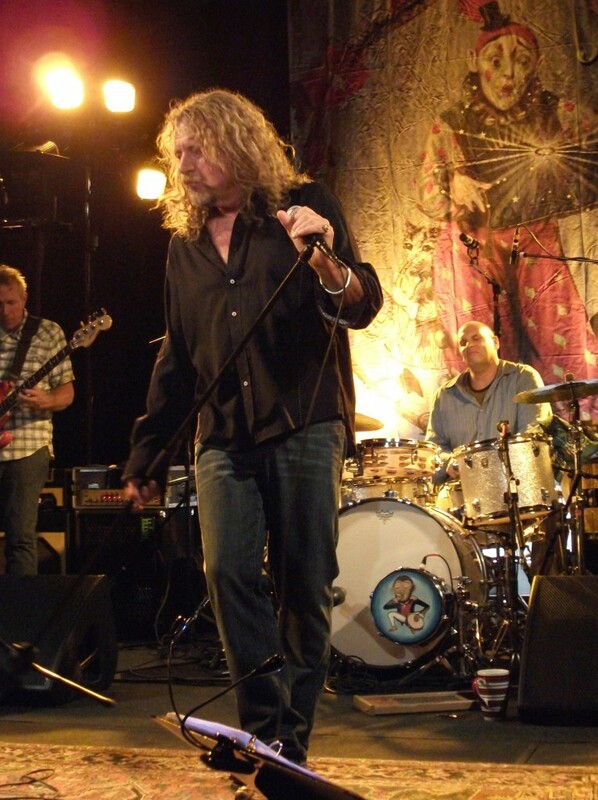 The ability of Robert Plant as a vocalist is not up for debate but the whole country thing certainly is. Plant has produced some top drawer albums since the demise of Led Zeppelin, Manic Nirvana being a particular favourite, but this new phase and the last collaboration with Krauss leave me, quite frankly, disappointed. I don’t think the rehashed Zeppelin tunes work although strangely I liked the version of In The Mood he did on the last tour. Plant can still sing a bit, oh yes, but for me anyway it’s all lost. Can’t see me buying the new album. Another brief stint working with Jimmy Page is whats needed here. Oh well…roll on Roger Waters next year !! Warning for Steve above – buying “seats” for any gig at the Forum is no guarantee for being able to see any more of Percy than you managed downstairs! This is because of the Forum’s anachronistic seating arrangement, which as unreserved and unnumbered on benches rather than seats means that anyone arriving later than 8pm is shuttled up to a standing room only area packed six deep up in the Gods! This quibble aside, it was noticeable how the band’s restraint on the old classics such as OTHAFA and MMH were both admirable yet strangely unsatisfying: testament I would suggest to the sheer brilliance of the tempo changes employed by the original band in the form of exquisite riffage, drum explosions and bassline twists all those years ago. 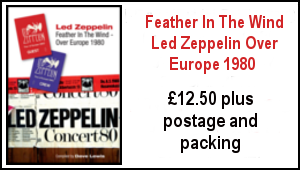 I (and it appeared many around me) realised during the gig how much those played a part in elevating Zep above the norm and into the stratosphere, and hence these were missed more than I could have predicted during Thursday’s gig. Thanks for this Dave.It seems like yesterday that we used to chat in WH Smiths in Bedford. I live in Brum now and bump into Bob from time to time around the rural Black Country where he lives. I am delighted that he is doing this now which can be judged on its own merits, rather than trying to recreate a Zep era thirty years ago which cannot be bettered. Well I had a great time! Met lots of nice new people, had a few beers, and rounded off with an hour and a half of top music. No complaints about the music, but a slight disappointment with what WASN’T played – no Silver Rider, In The Mood or Tangerine, 3 of my favourites from the Miami boot, but I’m being picky. Oh, and I’m not keen on Move On Up In Glory, a bit too “country by numbers” for me. Have just watched Robert on Andrew Marr’s show doing You Can’t Buy My Love which blew a few Sunday morning cobwebs away…! Oh – Happy Birthday Dave! Have to agree with Dave Linwood for the most part although I do like a bit of steel guitar and banjo. 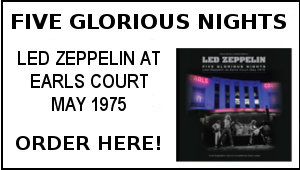 The new arrangements of the Zep classics did not work for me either – I just wanted Percy to really let rip! Disappointed he didn’t do Tangerine or In The Mood which he played in the good ol’ US of A – Although I’d have probably been disappointed with those arrangements too! I enjoyed the first few tracks especially Monkey (agree with Dave Lewis that Buddy was awesome on this) but after that it all got a little repetitive – maybe it is the fact I’m not familiar with the songs yet, I don’t know. All in all did not really enjoy the gig and I’ll buy seats next time so I’m not fighting for a view of just Percy’s head! Great to see everyone in the pub beforehand. The gig? Nope – didn’t like it at all. I’m not a country fan so the sight of a steel guitar (and banjo)was not particularly welcome. The band were tight and played well, just not my thing. I say to my wife that a man can never have too many guitars ( I seem to have 9 ), but Buddy Miller almost crosses that line – how many did he use last night? They all sounded good,though. + Darrel’s oh so sweet pedal steel brought a tear to this big oaf’s eye on more than one song. Now wishing I was going to Birmingham – and is talk of further London shows merely fanciful….? What a great show, what a great night, it was fabulous to see a tonne of faces that I haven’t seen in years, to catch up, to recollect, to reconnect to what is the most AWESOME force in musical history…fan-bloody-tastic! Just awesome…you were on the money Mr Lewis! it was a pleasure meeting up with dave/gary/chris/tracie etc etc. ps: dave enjoy your birthday celebrations with the headbangers. Fantastic evening ..great to see old and new friends. Special thanks to Stewart for letting us buy the extra ticket! Looking forward to seeing it all over again in Birmingham in October , this time with third row seats. 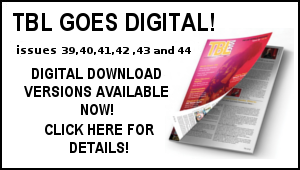 What a treat we’ve had this year , being lucky enough to TCV and Band of Joy …..
Angel is dancing on the radio as I write this!! Thanks for a great review of the show and its made me soooo excited to see the great man and his Band of Joy…great to see him on breakfast tv looking so fresh and …ooooooooh after a night of performing !!! Excellent gig but I’m not sure about the re-arrnagement of Over the Hills And Far Away, it lost it’s light and shade contrast, at least to me anyway. Well done and come back soon. Part of my life for 37 years. I’ve got tears of joy in my eyes even as I read the review. Seeing him in Birmingham in October. Cannot wait. Thanks for the prompt post, been checking every 10 minutes – knew you wouldn’t let us down. Love the new stuff on the radio, interesting he’s gone back to Clarksdale, perhaps JP might ‘help out’ on a gig? Can’t wait till Manchester on Halloween. Keep up the good work.